At Hired Hands Homecare, we provide elderly care Santa Rosa and surrounding area families need. Below is a list of our full service area. If you have any questions about whether we provide home care services in your area, please contact us. Marin County Office: WE’VE MOVED! Proudly providing Home Care in Sausalito, Mill Valley, Tiburon, Belvedere, Kentfield, Ross, Corte Madera, Greenbrae, Larkspur, San Rafael, San Anselmo, Fairfax, Woodacre, Terra Linda, Lucas Valley and Novato. Proudly providing Assistance for Seniors in Petaluma, Sonoma, Rohnert Park, Cotati, Santa Rosa, Sebastopol, Windsor and Healdsburg. 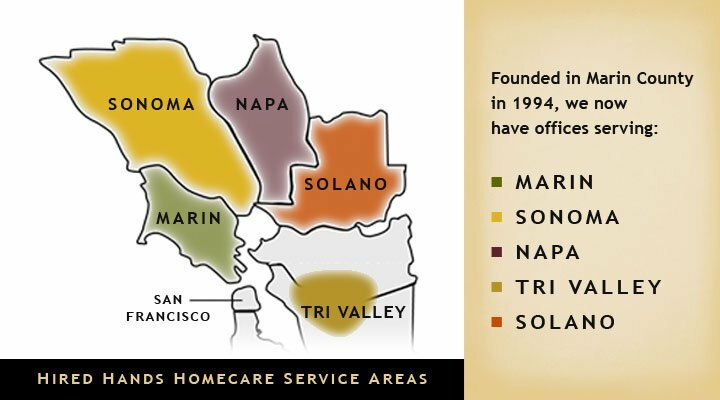 Proudly providing Caregiving in American Canyon and the Napa Valley including Napa, St. Helena, Rutherford, Yountville and Calistoga. Also NOW in Solano County. Proudly providing Senior Care from downtown Pleasanton to the Tri Valley area, including Pleasanton, Livermore, Dublin, San Ramon, Danville, Walnut Creek, Sunol, Freemont, and Castro Valley.